I created a problem this week because I helped too much. A member of my team made a few casual comments. I took the ball and ran with it. The people who should have taken action weren’t even at the table. Rather than asking the above questions, I made some quick decisions and sent a few emails. I solved a problem that didn’t exist. I was just being helpful. It’s not helpful to help too much. Provide clarity and help with communication, when necessary. Do things only you can do. Get out of the way. Let others do what they do best. Honor people’s contribution and celebrate progress. Don’t be too helpful with problems – don’t be aloof, either. When someone walks in your office with a problem, they say they want help, but that’s not always true. 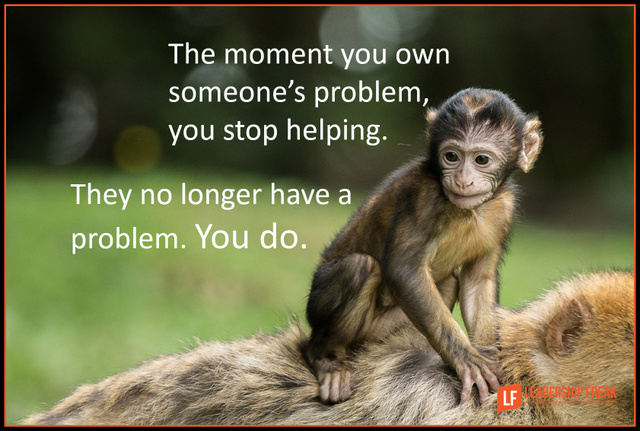 What they often want is for you to take the problem – the monkey – off their back. “Helpful” managers are too eager to own monkeys. You’re overworked and overwhelmed because you’re too damn helpful. Over-helpful managers create helplessness in teams. The moment you own someone’s problem, they no longer need help. They don’t have a problem. You do. Real help is enabling, not disabling. How might managers deal with the problem of owning other people’s problems? Thanks Seeker. Great question. I think I’m addict. 🙂 The more I think about this situation, the funnier it becomes to me. How could I be so out of touch? I like your approach. I’ve been training internal coaches to avoid “we” language. If they are going to do the work, say “you.” Of course, “how can I help,” is useful and may be appropriate. Thank you. My last resort, of course, is “How may I help you?” I may not be helpful once the individual find a solution to the problem. Thanks VW. I find that I have this problem and need to keep reminding myself not to be too damn helpful. I think most experienced “professional problem-solvers” occasionally make this mistake. You are certainly not alone. It is easy to perceive a description of a problem as a plea for our help. Asking “what do you think you should do about that?” can clarify if action is already planned or in-progress, and let us know that, hopefully, we need do nothing. Unless a colleague starts a conversation with “I need your help,” I try not to presume to offer any unless asked. Even when we occasionally step in unasked, I believe a spirit of “servanthood” communicates that we mean well even when we misunderstand what is needed, and we can be forgiven. Thanks Jim. Your distinction between describing a problem and asking for help is powerful and very helpful. Wonderful insights. The challenge is that if these folks work for you, then it IS your problem too. You have to balance whether you have the time to let this be a staff-development opportunity, or whether there is a situation that needs to be fixed now with training to follow. Thanks Douglas. There’s more to your comment than meets the eye. You have a commitment to develop people. Problems are an opportunity for development, unless other issues take priority. Love it. Have been gulty on many occasions. What you permit you promote. Now that you’ve admitted to your challenge, re-engage the situation and get back into the experience. You’re going to be fine coach! Good advice. Delegation is a skill that surprisingly few people truly possess. Thanks Ben. Glad you added the term delegation to the conversation. That’s an important answer to those who tend to help too much. Todd Whitaker has a great book about this – “Shifting the Monkey”. Don’t take things on others should be doing. Make sure you support them in their work, but don’t take on someone else’s work. Thanks Lance. I appreciate you extending the conversation. For anyone who is interested, here’s an amazon link to Shifting the Monkey. This is my issue…people come to me and I instantly feel “on the spot” and that it is easier for me to take care of the problem than putting it back on them. I still wrestle with coming up with the questions. I posted the four questions to get started the next time. Thanks Mary. They say you have to see it before you can deal with it. 🙂 Best wishes for the journey. In BSA Wood Badge training, they taught me to ask, “What do you want?” with careful emphasis/inflection on the right word. This question would have most likely directed the discussion in the most productive direction. When a leader empowers their team by butting out and letting them do the work; even if they aren’t successful, they will be building a stronger team. Being able to delegate to and TRUST your team to do their best is a trait that makes leaders so much more effective. I think trust plays a huge part in being able to step back and remove roadblocks for your team. If you are not removing roadblocks then you probably ARE the roadblock. Get out of the weeds, put down the monkey, and trust your teams. Thanks Margie. Adding trust to this conversation is important. I think successful leaders learn to trust people. Connecting trust with “butting out” gives me personal context. I sure don’t want to be the roadblock. I have a post-it note on my computer that I keep as a reminder: Help is not helpful until it is needed AND wanted. I need to remind myself of that often! alternatives. If they have an idea about the solution we discuss it and what needs to happen to ensure success. “Monkey Management.” An instructor in a leadership program I attended walked around with a long armed stuffed orangutan around her neck, while she lectured about how others (co-workers, friends, family, etc.) would try to give their monkeys (problems) to you. That has really stuck with me. In fact, I think I took it to the extreme. Anyone who walks in with a monkey on their back walks out with it too! It’s a bit like parenting sometimes. You have to be willing to let them stumble – and then help them dust themselves off and think things through so they can have at it again. But if you intervene and keep them from stumbling, then the monkey becomes your BFF.